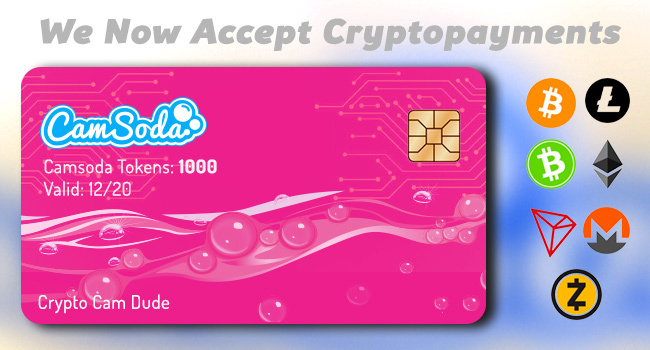 April 9, 2019 – CamSoda today announced that it is accepting cryptocurrency as payment options. The platform will now accept seven specific cryptocurrencies, including Bitcoin (BTC), Bitcoin Cash (BCH), Ethereum (ETH), Litecoin (LTC), Tron (TRX), and privacy coins Monero (XMR) and Zcash (ZEC). With the rise of crypto currencies and increased demand for privacy, users are now able to purchase tokens on CamSoda with crypto payment options. Tokens can be used for tips, live shows, private chats, and more. CamSoda has partnered with CoinPayments, the global leader in crypto payment processing, to provide users with support for their crypto transactions on the platform. To buy tokens using crypto currency please visit Camsoda.